As I stood in the carpark overlooking Wied iz-Zurrieq, I could make out Filfla on the horizon, shrouded in a sunny afternoon haze. 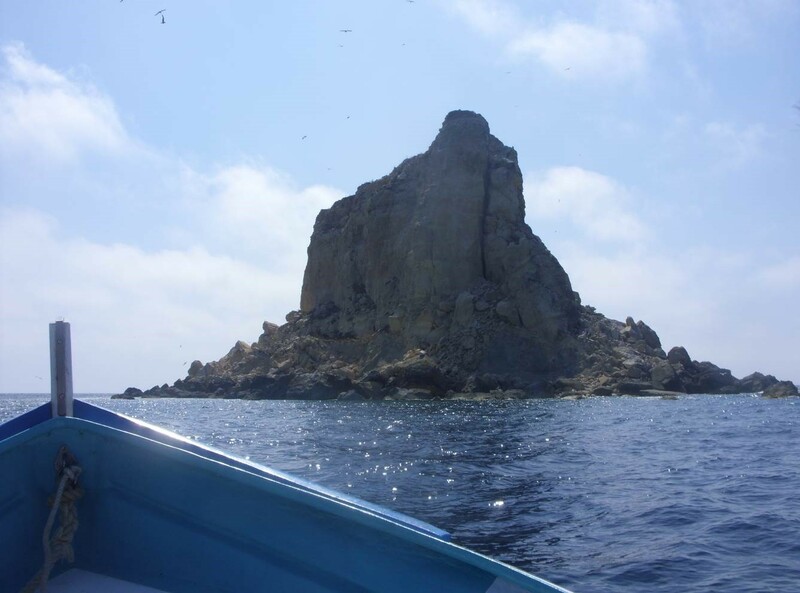 It was only as the boat approached Filfla, you really got a sense of its true size. Its grand vertical cliffs surrounded by a skirt of giant boulders and rubble, a real reminder of its history as an old bombing practice ground for the British Military. Now access to the island is restricted for research purposes only and requires a special permit. I looked up, the sky was dotted with Yellow-legged Gulls. I had previously seen the odd one fly past at a distance from the Maltese cliffs when out and about, but this was a breath taking experience. Mixed in with the ‘typical’ call of the gulls, the sort of chatter you might hear at the seaside but multiplied …a lot! It really was an ‘I am so lucky to be here’ moment. 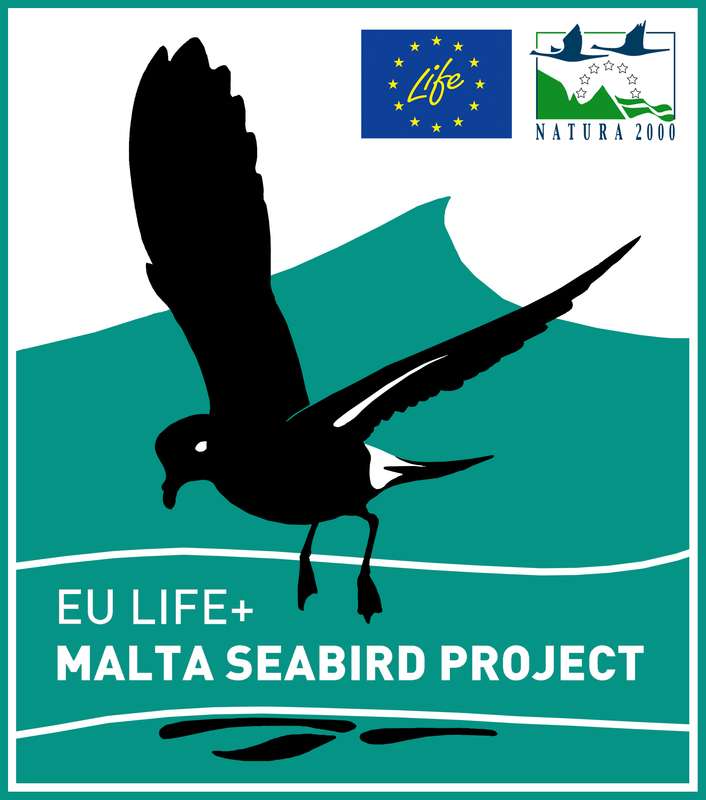 Filfla is the most important breeding site in the Maltese islands for Yellow-legged Gull and since 1982 Filfla has been visited yearly to monitor the Yellow-legged Gull’s colony. The aims for this trip was to firstly ring any Yellow-legged Gulls that were now old enough, check a few Scopoli’s Shearwater nests as well as look for Mediterranean Storm-petrel remains in Yellow-legged Gull regurgitates. 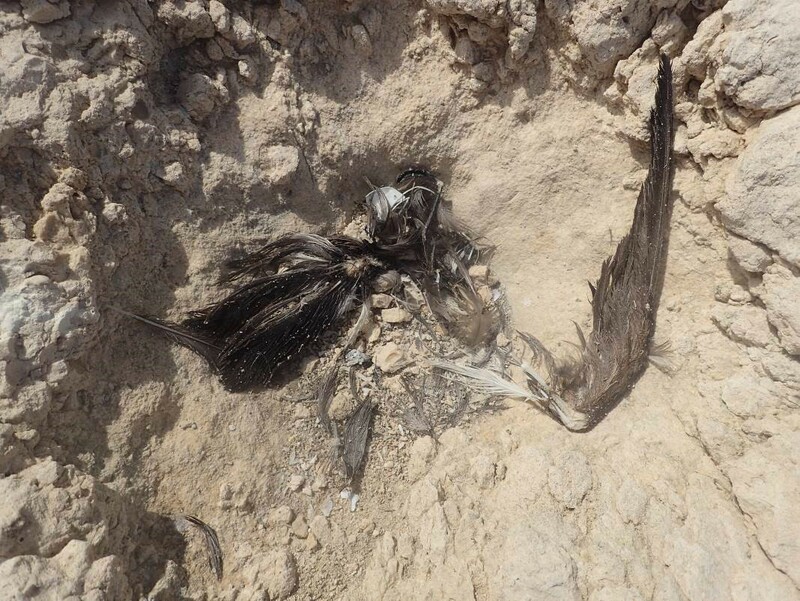 Previous trips to Filfla had collected these regurgitates from the lower slopes of Filfla, with the hope of assessing the degree of Storm-petrel predation from the Yellow-legged Gulls. This was due to studies suggesting gulls maybe strategically building their nests near Storm-petrel burrow entrances. Predation by Yellow-legged Gulls on the small tube-noses has also been reported and studied in other colonies of the Mediterranean Sea, such as Benidorm Island (Western Mediterranean, Spain). As previously mentioned whilst on Filfla we searched for any Yellow-legged Gulls’ chicks. At the time of this visit, most of the Yellow-legged Gulls had already fledged. 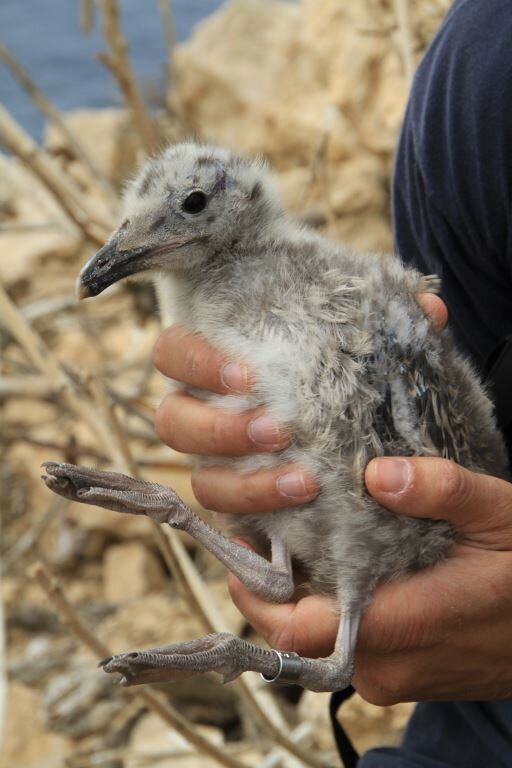 However, due to multiple reasons some gulls may lose their eggs earlier in the season and lay a second clutch in order to try again (in contrast to the Storm-petrel and Scopoli’s Shearwater which only lay one egg per season!). By doing this it can mean that chicks are often at various sizes and on each trip not all individuals can be rung. On this trip 5 youngsters were ringed. Just before sunset, we set up a 12m Mist-net in the hope of catching some Storm-petrels. Now, this hopefully wouldn’t be an issue seeing as we were sat waiting (with the net in front of us) in an area where the Storm-petrels were known to breed. The net was open for a total of 8 and a half hours and during this time there was a near enough constant flow of Storm-petrels being caught after the sun had gone down…exhausting work but it was such an amazing experience to see this tiny seabird (not much bigger than a sparrow!) at such close quarters!! So after scrambling over rocks in the dark and getting covered in Storm-petrel vomit, a total of 354 new individuals were ringed with an additional 88 previously ringed individuals being caught. Species Recovery and Conservation based at Nottingham Trent University. Her final project consisted of Rat presence/absent surveys upon Alderney, in the Channel Islands and its surrounding islets. 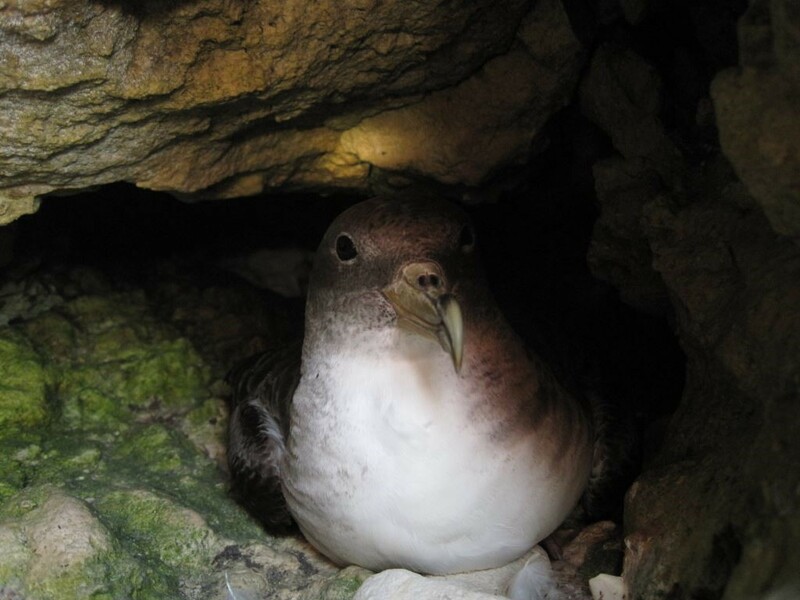 This was linked to the possible implications rats could have on seabird populations. Whilst having a general passion in conservation as a whole, it was during her MSc where she developed her interest in invasive species and island restoration.